I raved last year to anyone who would listen that red was going to be THE fall color and sure enough, red is a staple for all of this coming season. But you know what? 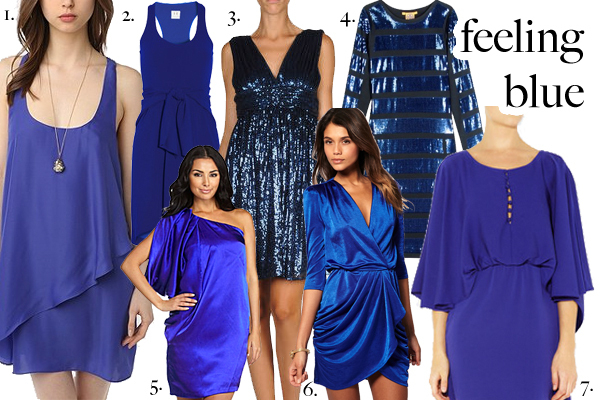 After NYFW and the Emmys, I’m convinced that blue is the new red. Don’t get me wrong — I’m still obsessed with red to help me brave the winter months (and there was plenty of red on the Emmys carpet), but the little part of me that’s dreaming about next spring can’t stop thinking about Santorini Blue. The hue feels like a breath of fresh air. But, seeing as spring is a good half a year away, I’m trying to focus instead on how to embrace the color trend now. I’m obsessed with the idea of wearing sparkly blue for the holidays, in the spirit of Amy Poehler’s Peter Som and Claire Danes’ Oscar de la Renta dresses. I love a 70’s-inspired sleeved blue dress with over-the-knee boots. And a blue tank dress like Katie Holmes’ Calvin Klein Emmys dress would also go perfectly with a boxy mustard coat for a popping color contrast, or a grey leather jacket and booties for a look that’s more downtown chic. What’s your fall color obsession?